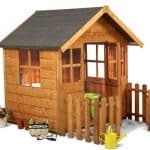 We’ve reviewed lots of Windsor playhouses, and always find them to be practical and attractive play areas. This Tulip model is their entry level model, which means that it can be affordable for even those operating on limited budgets. There’s still more than enough room for two children, aged three years and above, to play in and to keep a selection of their favourite toys and games in. The wide doorway opens out onto an integrated wooden verandah, which has a depth of 10” and provides a useful area of shade. We were impressed by how well constructed the playhouse as a whole is, from the felt covered apex roof down to the integrated floor joists. Most impressive of all is the use of tongue and groove cladding for the walls, and that’s the reason why the structure feels very stable once the easy assembly has been completed. 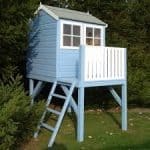 There are lots of optional extras available for this playhouse, which we always like to see, but one thing you won’t have to pay extra for is safety as the building meets the EN71 child safety toy standard. It gives added peace of mind, and also shows how safe the tough styrene glazing used in the three windows is. 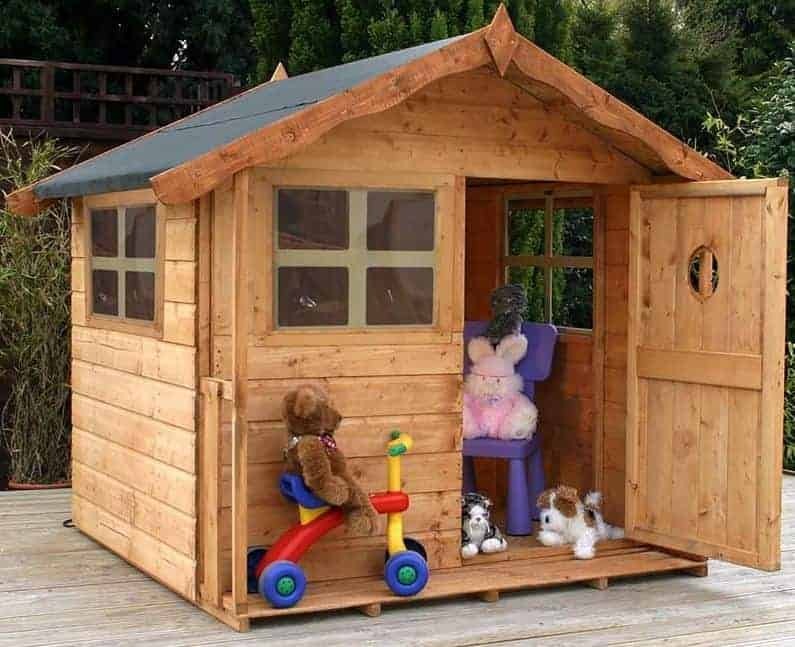 This isn’t the largest playhouse we’ve reviewed, and indeed it’s the smallest in the Windsor tulip playhouse range, but this itself can be advantage for those with smaller gardens or where space is limited. The overall width is 1.84m and the overall depth is 1.57m but these measurements included the overhanging canopy. Despite the relatively compact base area, the apex roof made of solid sheet material covered in roofing felt, gives it more height than you might expect. The ridge height is 1.54m and the eaves height is 1.12m so there’s lots of room for little ones to move around in. As well as using the interior of the playhouse as an all weather play away, and a storage space for favourite toys and teddy bears, there’s also the opportunity to play in a shaded area outside thanks to the natural verandah formed by the wooden canopy. We can imagine using this area to play boules from, especially as a boules set is available as a fun optional extra. 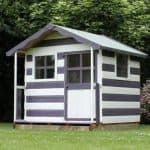 We were pleased to see that tongue and groove cladding had been used for the walls of this shed, and that it had a thickness of 12mm which is as much as any similarly priced playhouse that we’ve reviewed. With a standard 28 X 28mm frame as well, this creates a solid structure that can be relied upon even in windy conditions. The floor is made of solid sheet material with a thickness of 10mm, which is slightly thicker than some of the OSB floors that we see. We were glad to see that it has integrated floor joists as well, as by raising the floor off of the ground they protect it from the threat of moisture and therefore of rot too. The floor joists aren’t the only protection against rot here, as the timber has also been given a basic dip treatment. We would have liked to see a more effective and long lasting treatment used however, especially as it means that there is only a statutory one year warranty provided rather than the extended warranty that we often see. There is also an emphasis placed upon the customer to treat the playhouse in the early stages after installation as well as on an annual basis. It was good to see, therefore, that a free tub of treatment is provided to help with this initial treatment requirement. Despite the small nature of the playhouse, its door was wider than many others we see on the playhouses we review, opening to an accommodating width of 0.59m and with a height of 1.06m. Attached with study looking hinges it is also braced on the reverse to give it extra strength. In the centre of the door is a small round window but this is really a decorative feature as the main source of light are the three large styrene windows. With one on the front and one on each side, a lot of natural light gets into the interior on a sunny day, which your children or grandchildren will love if they’re trying to play a boardgame or read a book or comic. With so many windows included, it’s essential that they are both strong and secure. That’s why we were pleased that styrene, a form of plastic, had been used. It gives a clear view of what’s happening outside, but is much tougher than standard glass and therefore won’t shatter or easily break. The playhouse as a whole has been certified to meet the stringent EN71 toy safety standards, which we’re sure will be a big reassurance to people thinking of buying this product. There are many optional extras available, including a base kit which can be used to position the shed when a suitably level area of concrete or patio isn’t immediately available. 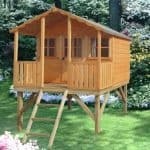 There’s also an option to have the base or playhouse itself professionally installed. While we found the building to be quite easy to assemble, this service could still prove popular for those with very busy lives. 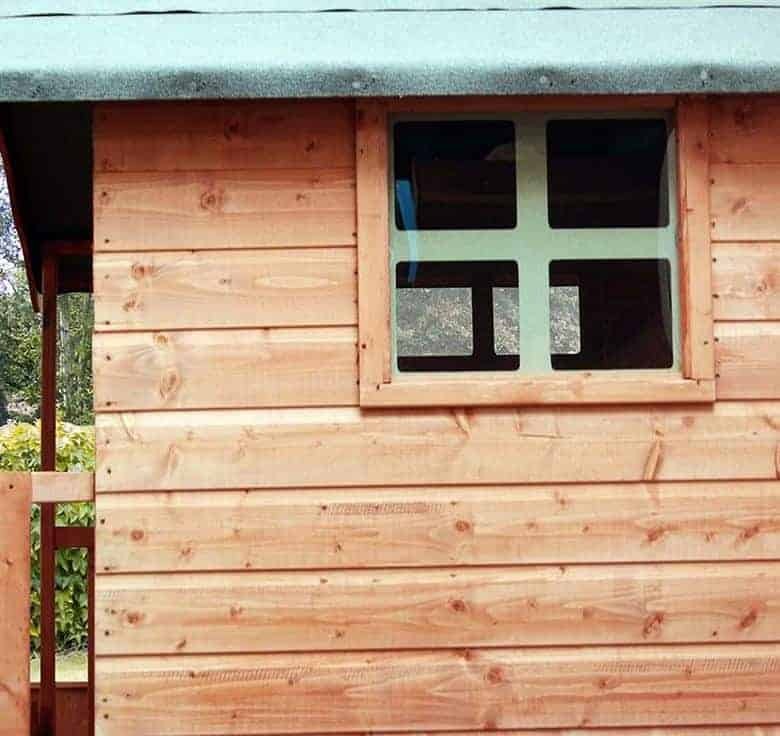 There are also four different shades of DIY treatment available, although we imagine that most children will prefer brighter and more vibrant colours for their playhouse. Windsor playhouses are renowned for the high quality of their components, and we were pleased to see that their entry level model lived up to this reputation. Although the thick cladding is durable in itself, the lack of an effective pre-treatment means that the customer has to apply regular treatments themselves. This is one of the more compact playhouses that we’ve reviewed, but it can still be lots of fun for one or two children. The size means that it’s easy to install and with a friend’s help it can be completed in around three hours. Alternatively, of course, the optional installation service can be paid for. 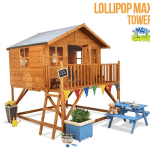 This is an attractive and high quality playhouse, but we have seen larger playhouses that come with a lower price tag attached. Final Thoughts: If you haven’t got a very large garden you might wish that there was somewhere that your children or grandchildren could play in safety. 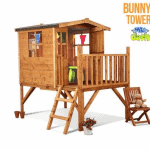 This compact yet well built playhouse could provide an ideal solution. There’s enough room for up to two children aged three and above to play with their favourite toys, and the overhanging canopy provides a cool and shaded play area on summer days. We were impressed by how strong and tough the building as a whole seems, although it will need to be treated with wood preserver within a few months of buying it and we recommend that it’s painted as well.